I almost didn’t write this post because my Hamantaschen are so ugly. In fact, they’re even uglier than last year’s which I didn’t think was possible. 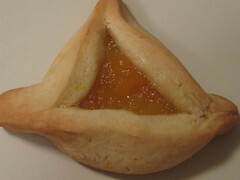 And you wouldn’t know it from looking at my photos, but Hamantaschen are triangular shaped cookies, representative of Purim‘s villain Haman’s triangular ears/pocket/hat depending on whom you ask. I think in Hebrew school we learned it was either Haman’s hat (remember the song?) or ears, but really–triangular ears? Anyway, Hamantaschen are soft cookies, traditionally with a poppy seed filling, but we grew up eating apricot ones, hence my apricot filling. I used the same apricot filling recipe (yum!) from last year but decided to give this new dough recipe a shot, and it’s good! However, I ran into one weird problem–I baked some on parchment and some on Silpats. The ones on parchment tended to open more and the ones on Silpats stayed sealed. Weird, huh? Fruit preserves. (Not jam.) You can also use Nutella. In a mixing bowl, cream the shortening, butter and sugar together. Add the eggs and blend until smooth. If the mixture is too hard to blend or seems curdled, add about 1 tbs of flour to bind it. Stir in the orange juice or milk and the vanilla. Fold in 4 cups of flour, salt and baking powder. Mix to make a firm but soft dough. Cover and let the dough rest for 10 minutes to give the flour time to absorb all the moisture. If the dough is too sticky to handle after ten minutes have passed, add extra flour up to 1/2 cup. The dough will be sticky when it’s ready, but you should be able to handle it without it getting stuck to your fingers. Line a large baking sheet with parchment paper. Divide the dough into 2 or 3 flattened discs and work with one portion at a time. Roll out the dough onto a lightly floured board to a thickness of 1/8 inch. Use a 3-inch cookie or biscuit cutter and cut as many rounds as you can. In a small bowl mix 1 egg, 1 tablespoon of water and a pinch of sugar to make an egg glaze. Brush the rounds with the wash, then fill each with a generous 1/2 teaspoonful of your desired filling. Fold 3 sides of each circle together, creating triangles. I like to leave a little space in the center so you can see what the filling is (plus it looks pretty), but you can also seal your hamantaschen completely. Brush the cookies with additional egg wash. If desired, sprinkle with regular or coarse sugar, and bake in the center of the preheated oven until golden brown, 18 to 25 minutes. Cool on the baking sheets. Bake your hamantaschen in the upper third of the oven – usually the bottom part of the oven is too hot and may also cause premature bottom-browning. If you want to use leftover scraps to make more cookies, only roll them out once more because a lean dough like this one can only be rolled a couple times before becoming really tough. This dough can be frozen for about 2 months or refrigerated (wrapped well in plastic) for one to three days. Just give it time to warm up before rolling it out. You can also freeze or refrigerate the filled triangles before baking. If you do this, just bake them without defrosting. I used orange juice rather than milk. I skipped the egg wash. Mine baked in about 15 minutes. I used a regular old glass rather than a cookie cutter and got about four dozen cookies. Recipe from A Treasury of Jewish Holiday Baking by Marcy Goldman via Baking and Books. In other news, what do you think of the site redesign? The amazingly talented Maria designed the header image and I think it’s just adorable! Please bear with me as I work out the kinks of the new template and let me know if you notice anything funky. I’m currently trying to figure out why the live comment preview works in IE but not Firefox, so if you’re familiar with WordPress, now would be a great time to show off your expertise! I am glad that you posted your photos and the recipe. Personally a perfect looking Hamantaschen would scare me. Your triangular yummies look wonderful and make me wish we had the time to make them here. Maybe next year. For now I must cope with the fact that Passover is just around the corner. I really like the new look of the site!!! Love the new look of the site. It’s wonderful. I didn’t get to make hamantashen this year, but every year in hebrew school we made them. My favorite was always filled with chocolate. Let me know if you have any good passover desert recommendations, I’ll have to start thinking about that soon. Hi Hilary – I am happy to find your site! Your hamantaschen look great to me! Ugly! No way! Actually, your ‘taschen look prettier than mine do. But people don’t seem to care either way–because these taste so good! Stumbled on your site. Happy Purim, a few days late. In case you were thinking of hamantashen, here’s what happened to me this year. I made hamantashen on Sunday with Marcy’s recipe. Except that I used the recipe for her Chanukah decorated sugar cookies, in the Chanukah section of her Treasury of Jewish Holiday Baking book and kept the additional egg and baking powder amount. The recipes are similar. The hamantashen one uses more shortening and the extra egg. The liquid for the Chanukah cookies is added last while the hamantashen liquid is added before the flour. The hamantashen dough was definitely softer. Next year I plan to use the Chanukah dough and see what happens because my cookies weren’t that pretty either. I was wondering if the extra egg made the dough too soft and more likely to spread. It’s so strange that, while some were decent lookng, others were leaking and look…well…icky. Another interesting thing that happened: A friend of mine is allergic to walnuts. I had some leftover Clearbrook Farms apple pie filling and used it for some to give to her. Those cookies looked much prettier. I was thinking that the non-spreading chunky apples helped keep the cookies together. Next year I plan to add more walnuts to make my apricot filling firmer and see if that helps with the spreading. Maybe the oldfashioned poppy/prune fillings didn’t spread as much as the apricot ones or the ones made with straight preserves.